First published in 1984, Michael Redclift’s book makes the global environmental crisis a central concern of political economy and its structural causes a central concern of environmentalism. Michael Redclift argues that a close analysis of the environmental crisis in the South reveals the importance of the share of resources obtained by different social groups. The development strategies based on the experiences and interests of Western capitalist countries fail to recognise that environmental degradation in the South is a product of inequalities in both global and local economic relations and cannot be solved simply by applying solutions borrowed from environmentalism in the North. The key to understanding the South’s environmental problems lies in the recognition that structural processes – markets, technology, state intervention – are also a determining influence upon the way natural resources are used. 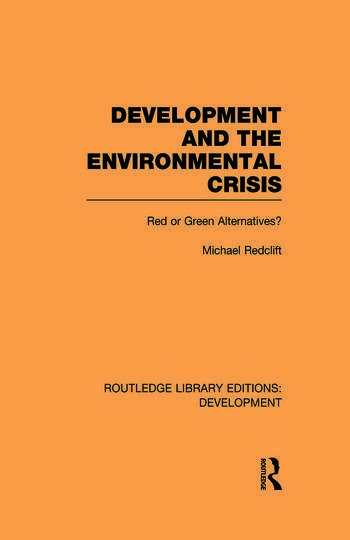 Through his review of Europe’s Green Movement, contemporary breakthroughs in biotechnology and information systems and recent feminist discourse, Michael Redclift has enlarged the compass of the environmental debate and produced a book which should serve as a benchmark in future discussions of development and the environment. It will be of importance to students in a range of disciplines, within development studies, geography, ecology and the social sciences.